Everybody loves fresh flowers! They make wonderful gifts and can add a pop of color to any room in your home, or an event you're throwing. However, custom arrangements are pricey and grocery store flowers have a bad reputation for being generic and unremarkable. Something that you may not know is that my grandmother owned a flower shop called Rosebud. My mom used to help in the shop so I asked for her help with today's post. I headed to the grocery store and grabbed a bunch of garden flowers and one bouquet to pull apart and create my own custom arrangement for a fraction of the price. Before you head to the grocery store to pick out your flowers you will need a couple of things: some kind of vase and a wet foam brick. If you're doing this on a budget, somewhere like TJ Maxx has great deals on cute vases, or you can use one that you already have. A wet foam brick will help you create your arrangement and extend the life of your flowers. You can find these online or at a store like Michaels. This is the exact one I used. 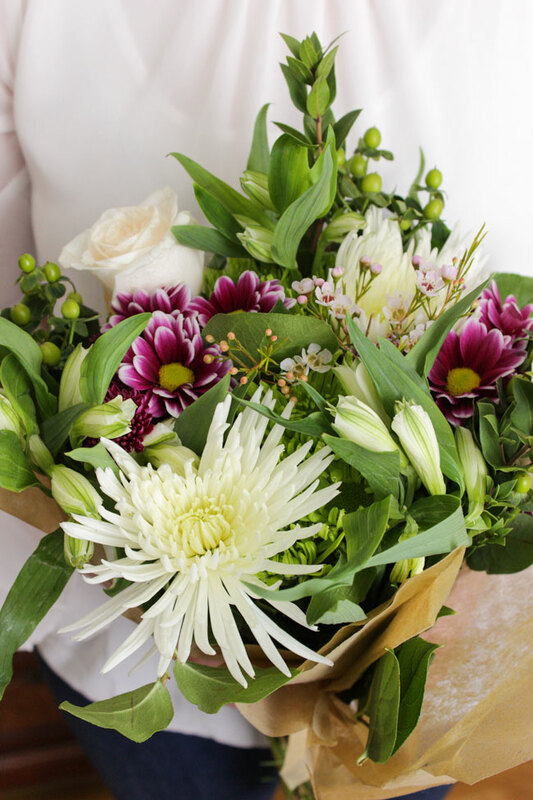 When you're picking out your flowers ignore the way they're arranged and just look at the flowers that are in the bouquet or bunch. There are different ways you can approach this. 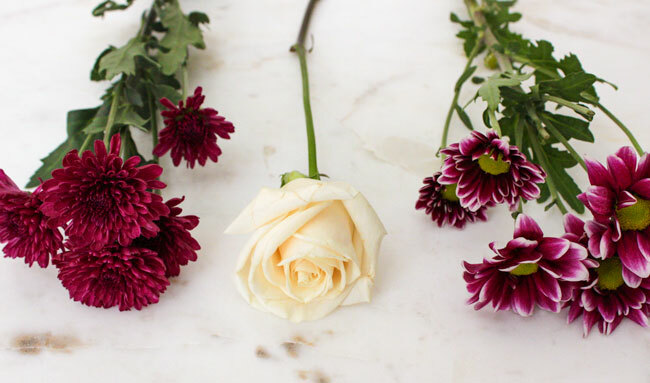 You can go for a monochrome look and do all flowers in the same color or color family. 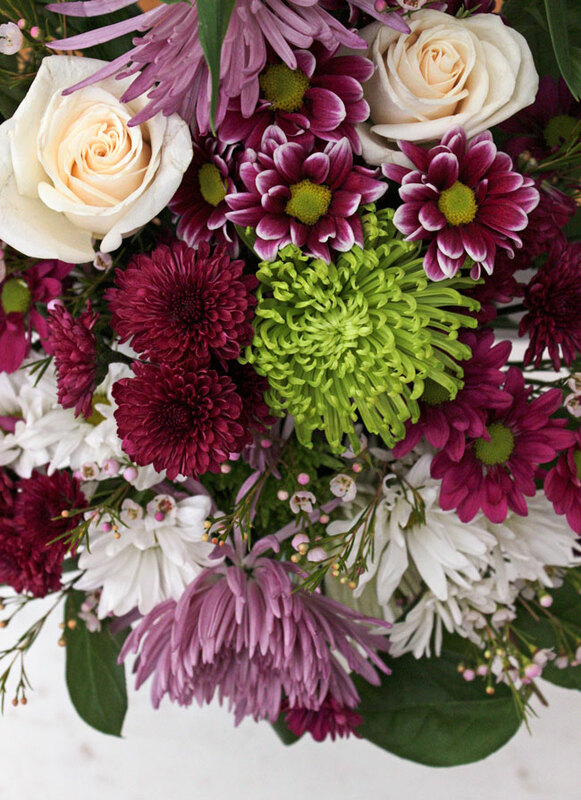 Another option is to do what I did and mix and match color stories from different bunches or bouquets. Or you also could just do a bunch of fun bright colors. 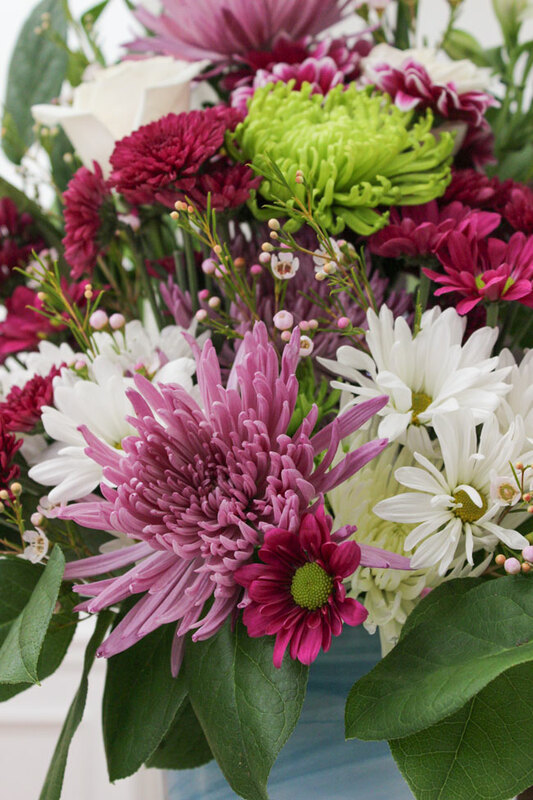 Once you're home, you're going to want to take apart the bunches and/or bouquets that you bought. Lay everything out on a table and put all the like flowers and fillers together so you can see what you have. Then, place your foam in your vase or container (you may have to cut it to fit) and saturate it with water. Now you're ready to start arranging! As you place the flowers cut them with a sharp knife at a 45-degree angle taking note of the height and how much of the stem you're going to stick into the foam. Also, remove any leaves below the water line on the stem. As a general rule of thumb, the tallest flowers and filler in your arrangement should be at least twice the height of your vase. Use your tall spikey flowers to create the height first placing them in the center back, and lower right and left sides creating a triangle. 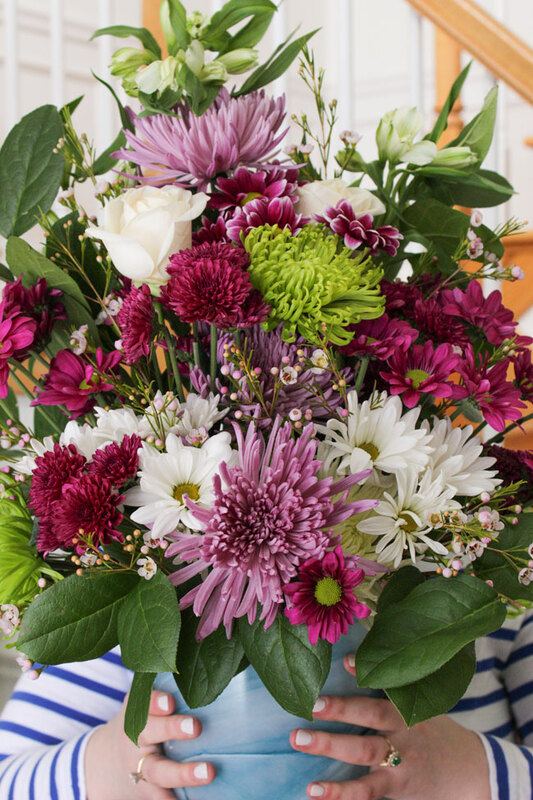 Next, fill in with your focal points; larger blossoms, roses, or anything you want to receive attention in your arrangement. 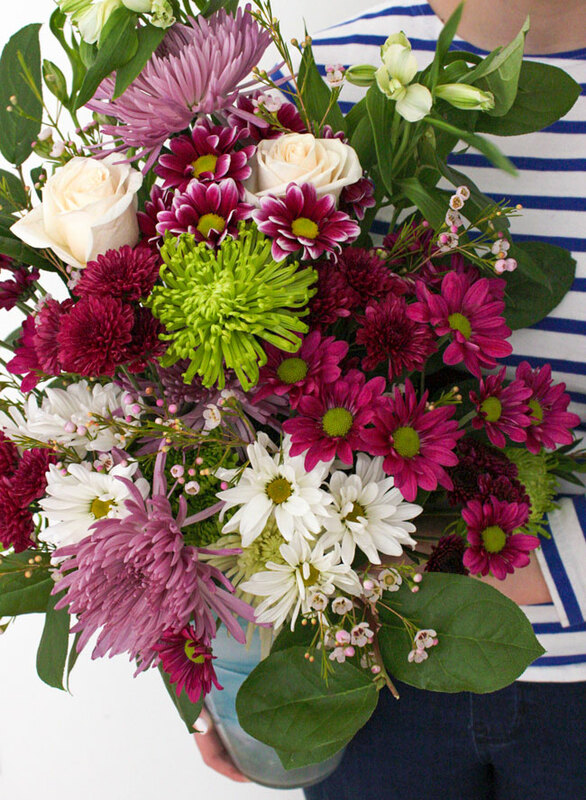 Next, use smaller flowers or stems of smaller flowers to fill in around these focal points. Then, add filler flowers or greens like baby's breath or ferns, whatever came in your bouquet or bunch. Don't forget to fill in the back of your arrangement where the foam is showing. Here you can use your leftover greens or flowers and stick flowers that don't look the best to cover the foam. As the last step, fill the vase the rest of the way with water and the flower food that came with your bouquets and/or bunches at the grocery store. Make sure whether you are keeping the arrangement for yourself, or gifting it that the water is replenished daily. You want to make sure the stems are covered with water inside the vase. I love this, I always just buy bouquets and put them in different rooms, but now I need to make arrangements, it seems so easy! Thanks so much Missy! I'd love to see a picture if you arrange your own! Such great tips! Love this! I have seen wet bricks for flowers, but never used one. I need to get one as my flowers always look crazy and not put together. Loving the tips. Thank you! 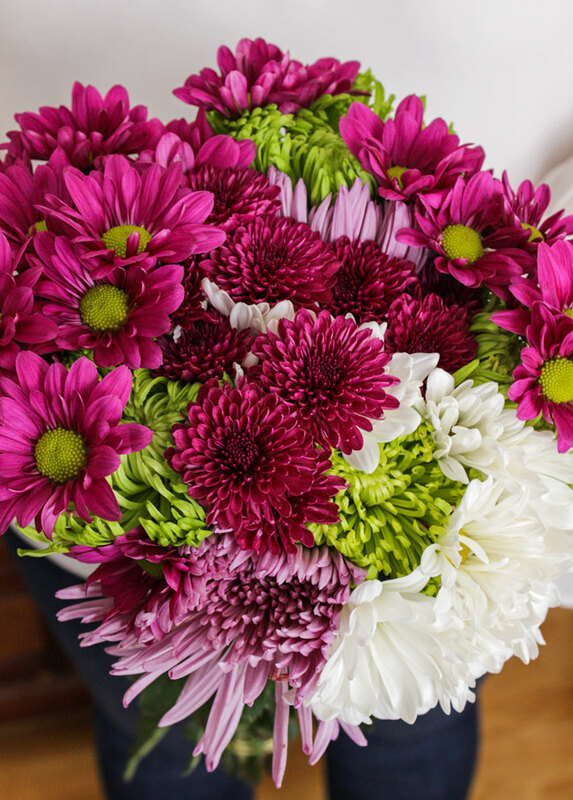 Nothing brightens up a day like a beautiful bouquet of flowers! OMG love this post (so perfect for spring)! I think it would be so fun to be a florist, you did an amazing job! That is just perfect for Spring. These are such pretty flowers, I often pick up flowers from the supermarket.